After 16 years at the forefront of dense array EEG development, we are proud to announce the release of our MR compatible system, the Geodesic EEG System 300 MR. In this inaugural edition of our Research eNewsletter we discuss our approach EEG acquisition in the challenging MR environment. Imaging artifacts: During each head volume acquisition, both the gradient switching and radio frequency pulse pattern will produce strong artifacts that will obscure the EEG. However, the TR chosen for a particular scan protocol will provide this artifact with a very specific temporal pattern. Cardioballistic artifacts: Every time the heart beats, the resultant micromovement of the head causes this periodic artifact. Cold head artifacts: The cryogenic pump of the MR system causes a systematic artifact. EEG/fMRI: Take a peak under the hood of this new MR compatible EEG system. Customer Achievements: EGI's first customer receives top US award. New Products: Fall product preview. Events: Register for our upcoming Focus on EEG/fMRI event. Where to See EGI: Conferences and events around the world. Employment: Work with a fast growing, innovative company. Dr. Michael I. Posner of the University of Oregon is named one of nine eminent researchers to receive national award. 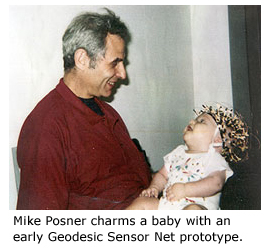 His current work deals with the development of brain networks that underlie attention and self regulation. Dr. Posner has long been regarded as an authority in the field with over 500 articles and citations of his work on understanding attention and self regulation. Net Station 4.4 supports EGI's new products with ease. New features include online and offline MR artifact cleaning, polygraphic channel support, and Network Time Protocol support (NTP). Record polygraphic channels for neuroscience and sleep research with EGI's Polygraphic Input Box (PIB). Record up to seven bipolar channels synchronized with your EEG with EGI's Net Station 4.4 acquisition software. The long anticipated E-Prime 2.0 Professional is available for use with your Geodesic EEG System 300 series. Setting the new standard for experiment control, EGI and Psychology Software Tools, Inc. teamed up to implement Network Time Protocol (NTP). NTP is a protocol designed to synchronize the clocks of computers over a network. For portable systems, a direct TCP/IP connection works as well. Join us on Saturday, October 24, for a free workshop on EEG/fMRI. This event is held in Berlin, Germany in conjunction with the annual Society for Psychophysiological Research meeting. Go to EGI's Employment page.